If you love horses you might be thinking of planning a career based on their care, use, or supporting a breed or sport. There are many different occupations you can consider. Some require only on-the-job training, while others are professional careers that have educational requirements, certification, and licensure. Here is a list of jobs with horses or related to the horse industry. Rider: Riders may exercise racehorses, be paid to school or warm up performance horses, or catch rides at shows or other events. Catch Rider: Catch riders attend horse shows and ride horses for clients, often on short notice. Instructor/Coach: Most instructors and coaches also train or board horses, or have other work either within or outside of the horse industry. Trainer: Trainers may start young horses, deal with problem horses, or give clients’ horses specialized training. Therapeutic Riding Instructor/Support Staff: Therapeutic riding schools require a lot of support staff for an effective and safe program. Many positions, however, are volunteer. Jockey: Jockeys ride racehorses in competition. Groom: Grooms may look after the day to day care of a horse, or a stable of horses, and may prepare them for competition or sale. Farrier: Farriers care for horse’s hooves and apply and remove shoes. Stable Manager: Stable managers oversee the care of horse stables and any employees. They are responsible for feeding programs, choosing feeds, stable hygiene, horse health, lesson scheduling, event planning and many other aspects of horse ownership and stable management. This can be a 24/7 responsibility. Barn Hand: A barn hand may be a jack-of-all-trades and be responsible for everything from horse care to machinery and structure repair. Trucker/Horse Transport: Horses haulers are frequently called on for both short and long haul horse transportation. Breeder: Breeders usually specialize in a specific breed or type of horse. Many show their horses and promote their breed. Breed Inspector: A breed inspector travels to stable to approve breeding stock or may attend shows or other events to approve stallions, mares or foals. Artificial Insemination (AI) Specialist: AI specialists may oversee all aspects of artificial horse breeding. Dealer: A horse dealer buys horses and sells them to clients. Many specialize in a specific type of horse or horses for a specific use. Farm Inspector: Farm inspectors may inspect farms for the animals' welfare, or they may inspect breeding stock for entry into programs or stud books. Some may work for insurance companies or other agencies. Insurance Broker/Sales: Equine Insurance brokers specialize in the unique needs of the horse industry, from providing insurance from simple liability for individuals to event, coach, or breeding farm insurance. Hay Dealer: Hay dealers buy and sell hay. 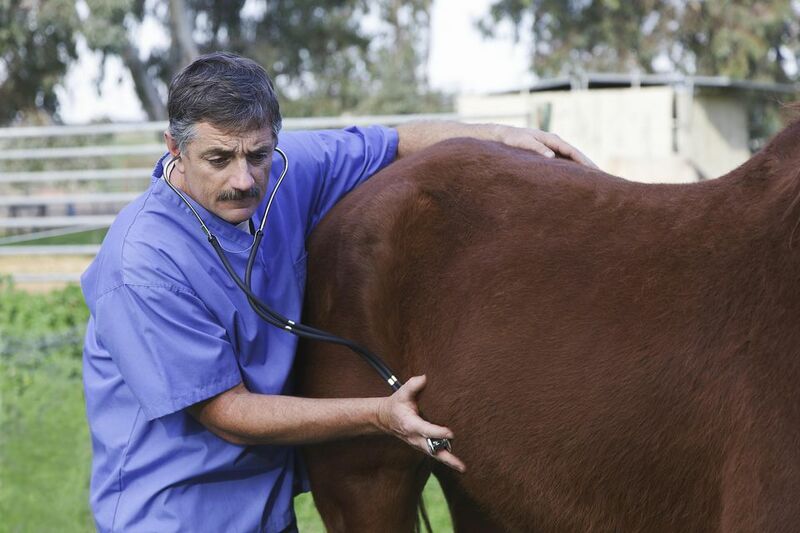 Veterinarian: A veterinarian will look after all aspects of a horse’s health, from digestive issues to lameness problems. Some specialize in breeding stock, lameness or other aspects of horse health. This profession requires college, veterinary school, and licensure. Veterinary Assistant: Vet techs are licensed professionals trained to assist vets in all procedures including surgery. Vet assistants may work with vets, but are not licensed and may have a more administrative role in a vet clinic. Equine Chiropractor: An equine chiropractor may give horses chiropractic adjustments. Depending on the regulations they may also be a veterinarian or human chiropractor. Equine Dentist: Often dentists may also be veterinarians. Equine Massage Therapist: Massage therapists help solve muscular tension in horses to improve quality of life and performance. Equine Physiotherapist: A physiotherapist may help with equine muscular and biomechanical problems. Equine Nutritionist: A nutritionist may formulate concentrate mixture, or they may analyze a horse’s feeding program and make suggestions for optimal health. Lab Technician: Lab technicians work with veterinarians or other equine medical professionals testing and researching. Saddler: Saddlers make and repair all types of saddles. Some may specialize in a particular type of saddle. Harness Maker: Harness makers may make bridles and other gear for riding horses, or they may make driving harnesses for light and draft horses. A harness maker often does repairs and may work on items that are non-horse related. Saddle Fitter: A saddle fitter may travel to stables to fit saddles and then take the saddles to be adjusted or repaired. Carriage Maker/Repair: Carriage makers make and repair horses drawn vehicles, or parts of the vehicles like shafts or wheels. Tack Shop Sales: Those who run or work at tack shops provide a wide variety of products for horse owners. Carpenter: Carpenters may build stables, jumps or other paraphernalia for the horse world. Seamstress/Designer: Some sewists design and manufacture clothing for riders, drivers and horse lovers. They may make custom clothing, or design or assemble for mass manufacturing. Toy Designer/Manufacturer: Toy designers and manufacturers produce toys for children and collector items for adults. Pony Ride Operator: Pony rider operators may work in one venue, caring for ponies and providing children’s pony rides. Or, they may travel to different events to set up their ponies and provide rides. Pony Party Organizer: Pony party organizers provide pony rides and pony themed favors for kids’ parties. Trail Guide: Trail guides take out individuals or groups on afternoon or overnight trail rides. Some might provide hunting or fishing guidance as well. Guest Ranch Operator/Employee: Guest or dude ranch operators and employees help tourists enjoy a ranch lifestyle holiday. Carriage Tour Driver: The carriage trade is falling out of favor in many places. But, there are still opportunities for carriage operators to cater to weddings and other special events. Show Judge: Show judges may specialize in specific disciplines and need to know the rules and requirements of their sport. Show Manager: Show managers are the event managers of the horse world. Show Support Staff (Stewards): Show require a lot of support staff, from secretaries to ring stewards. Jump/Course Designer: Jump designers create interesting but safe jumps, while course designers layout challenging by safe courses for jumping competitions. Jockey Valet A jockey valet may look after a jockey’s gear and clothing and may take on some of the duties of a horse groom. They may help the jockey dress on race day and may assist with the care of the horse following a race. Hot Walker/Pony Rider A pony rider escorts racehorses to the gates and hot walkers hand walk horses to cool them out after exercise or performing. Track Support Staff Racetracks require a large staff—from judges and other officials, barn staff, grounds keepers and accountants to servers and cleaners in public places. Software Designer/Programmer: Software designers and programs make software for the horse industry, from tracking spreadsheets for individual horse owners to breeding databases for registries and other associations. Web Site Designer: Some website designers specialize in the horse industry. Writer: Writers in the horse industry provide copy for newspapers, magazines, websites both in and outside of the horse industry. Photographer: Photographers specializing in equine photography may take photos for individuals or may be present at events. Artist: Artists in many different media often specialize in horse themes. What Are Wolf Teeth in a Horse?